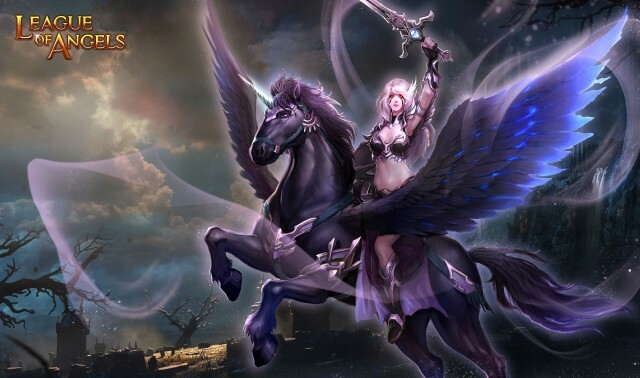 Riding on her flying horse of death, Dark Valkyrie is known in the underworld as the messenger of broken hearts. Born a human, she once flew around the world spreading tales of love and friendship. She fell in love with a mysterious lord, but he was deceitful and tried to steal her powerful Pegasus for himself. He did not succeed, but managed to injure the winged horse before being savagely killed by a furious Valkyrie. As her best friend and companion lay dying, Valkyrie promised she would follow her horse to the underworld if it died. A promise she kept. Now they are united forever in death, terrifying those who break the hearts of innocent lovers. Hero Skill (Lvl. 10): Dark Strike. Deals (110% Basic ATK + 300) to all enemies, taunting them into assaulting you while adding a shield that reduces all damage taken by 30%. Lasts 2 turns.